In terms of wine regions that have helped contribute to putting Australia’s top drops firmly on the international stage, South Australia’s Barossa Valley ranks amongst the top of its class. While it will sometimes be grouped in with other major Australian wine regions, the Barossa stands alone due to the mixture of its sheer volume of wine it produces annually, its picturesque landscape, and its extraordinary culinary offerings. Those who put indulging their tastebuds as top priority when planning a trip will thus find the Barossa hard to match in terms of Aussie travel destinations; and one that comes with a heavy dose of European influence and heritage to boot. Situated within easy reach of Adelaide (although you’ll likely want to avoid self-driving or stay overnight in order to enjoy its offerings guilt-free), it’s enough of a drawcard to rank as incentive to visit South Australia’s capital in and of itself. 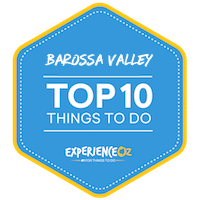 If you’re planning a visit to the region and not sure how to best spend your time, here are 10 of the top things to do in the Barossa Valley. All the additional frills, trappings and supplementary activities in the Barossa Valley may be enjoyable enough in their own right, however it’s the wineries themselves that remain the undeniable stars of the show and which draw the hundreds of thousands of visitors that flock to the Barossa each year. The Barossa is densely populated with such establishments both large and small, clocking in at over 150 in total in what is a relatively small and sparsely populated part of South Australia. Its proximity to SA capital Adelaide helps, too; the region lies only 60 or so kilometres a way, and thus is highly accessible both for travellers and those who have relocated to try their hand at wine production themselves. While it’s responsible for the production of all the major types of wines – and you’ll find wineries that specialise in different types dotted throughout – the Barossa’s specialty has always been Shiraz; largely a result of the region’s warmer continental climate. Riesling, Cab Sav, and various others also feature prominently, with some labels ranking alongside the premier in the world, and others remaining delightful, hidden gems you’ll likely want to keep all to yourself. Being located on the outskirts of the Barossa, food and drink unsurprisingly play a large role in the appeal of any stay here, with all of it beautifully presented and paired well with local wines. Browsing through the list of Barossa Valley wineries reads like a “who’s who” of Aussie wine labels, and many of the flagship vineyards of each can be found here and come with gorgeous design touches, fully-fledged dining experiences, sprawling vantage points, or some combination thereof. Jacob’s Creek: One of Australia’s most recognisable brands spanning over 150 years’ worth of winemaking history, the label has a dedicated Visitor Centre with a wonderfully modern design that stands in contrast to the older of its ilk that has still been maintained. Magnificent grounds, excellent wines and a top-notch restaurant round out the experience here. Langmeil Winery: Heritage-rich and historic, this critically-acclaimed winey possesses wonderful grounds, lovely architecture (including blacksmith), and staff who are obviously passionate and spare no attention to detail when it comes to all-things-wine. Sparkling shiraz is particularly noteworthy. Murray Street Vineyards: Gorgeous, charming winery with a more private and intimate setting that feels less commercialised than some other, bigger offerings. Great cheese platters an excellent compliment to quality wines. Penfolds: A large player that still makes efforts to retain its personalised charm, visitors to their Barossa winery will be able to sample some wine varieties from the label that they likely haven’t encountered in retail stores; great reds are a particular standout here. Peter Lehmann Wines: A “younger” winery in terms of history yet not lacking a strong presence on the Aussie wine scene, their Barossa offering is housed in a wonderful, grand building that simply screams “wedding venue” and offers quality wines and ports to boot. Seppeltsfield: Home to our aforementioned Segway tours, the winery and its surrounds are both gorgeous and draped in history, and serve as an attraction in and of themselves in addition to the friendly staff, lovely restaurant, and, of course, wines and ports. Wolf Blass: A larger winery that is home to another comprehensive visitor centre with plenty to browse and look at, including an extensive array of historic items, awards and wall-to-wall wine bottles that hint at its extensive range. Add in the potential for discovering the countless smaller boutique brands and their charming and often charismatic owners, and the enjoyment of exploring the Barossa’s wine scene is capped by only two things: time, and the capacity of your wallet. The rolling fields and vineyards of the Barossa Valley make for a pleasant enough spectacle when viewed from the road, however those wanting the ultimate vantage point of this verdant part of South Australia can instead take to the skies and view its lush beauty from high above. Hot air ballooning is one of the Barossa’s most popular non-wine-oriented activities, as the region’s characteristically clean air and calm skies are conducive to floating peacefully over the landscape far below. While it requires an early rise and shine in order to participate, the idyllic panorama cast by the glow of the rising sun over the valley’s charming features justifies the sleepy eyes, and if conditions are right you may even take in sweeping views of the Murray River far below. There are also few better ways to come away with quality photos of the region, and the typically stable and serene nature of a hot air balloon’s flight path make for excellent conditions for snapping panoramic shots. If you’re looking for the ultimate “Instagram-worthy” documentation of your time in the Barossa, then forking out for a balloon ride is well worth the investment. Ballooning itself is also a remarkably serene experience, as at points there’s no sound other than the occasional hiss of the balloon’s fire breaking up the peace. Those who are afraid of heights need not fear, either, as the region’s ballooning operators are used to dealing with first-timers and those with such a phobia, and are eternally reassuring and accommodating. The baskets of the balloons themselves are also surprisingly spacious, able to fit around 16 participants with a minimum of cramping. With the option to have the ballooning experience capped off with a tasty champagne breakfast that comes with a selection of typical Barossa-quality meats, breads, cheeses and fruits, it’s a great way to commemorate a special occasion, too. While it’s obviously a weather-dependent activity, time your visit on a clear day and you’ll come away with photography that you’ll find hard to match. Barossa Valley is the epicentre of the Australia food and wine scene and what better food is there to accompany wine than cheese? A visit to the Barossa Valley is not complete without a visit to the Barossa Valley Cheese Company in the town of Angaston. The cheesecellar is open 7 days a week selling a massive range of 25 different styles of cow and goat’s milk cheeses. The handmade artisan cheese is the brainchild of passionate owner Victoria McClurg. Originally a winemaker, Victoria decided her passion was in fact in producing cheese and since the Barossa Valley Cheese Company opened their doors in 2003 the awards have been coming in quickly. Ms McClurg says “her dream is to create something for people to share and enjoy” and we are pretty sure that delicious cheeses fit the bill. Who doesn’t love cheese? Don’t take our word for it though, go and see for yourself with free tastings available all day everyday and there is even Halloumi cooking demonstration at 11am and 3pm. All cheeses are available for purchase individually or you can purchase a platter for your picnic basket which can be paired with wines to complete the experience. Among some of the cheeses that can be found here are popular ranges such as the Barossa Brie, Feta, Halloumi, Camembert, Triple Cream, and unique offerings such as Wanera, Washington, Washrind, Blushing Princess, Le Petit Prince, La Dame, Le Petite Princesse. If you’re visiting the Barossa Valley and after the ability to purchase a dizzying array of fresh, high quality local produce – all of which comes with a blend of delicious aromas and friendly grins – be sure to pay a visit to the Barossa Farmers Market which takes place every Saturday. Having been in operation for nearly 15 years, the Barossa Farmers Market has long been a favourite of locals to purchase their fresh fruit and veg, however the market offers much more than that. It’s a concentrated mixture of foodstuffs of all kinds ranging from piping hot pastries, to delicious coffee, to fresh cuts of meat and poultry, to its famously refreshing icecream that makes for a tasty way to cool down on hot days. There’s a reason the Barossa Farmers Market is so popular – you simply won’t find this blend of both quality and variety in supermarkets, and the range of ingredients are sold by enthusiastic stall runners who are always friendly, upbeat, and willing to give both advice and cooking tips. In typical Barossa fashion, they’re often willing to let you try a taste or three of some of their foodstuffs in advance of a purchase, too, so it can make for a great go-to destination for first time visitors to the region wanting to get acquainted with what the Barossa’s flavours are all about. Many of the food options are cooked, baked and otherwise prepared with health in mind; organic ingredients dominate throughout, and make for a far cry from the processed condition of similar offerings in chain stores. The full gamut of dietary needs are also catered for at many of the market’s stalls, so those on gluten-free or other restrictions won’t find their options too limited here, either. There’s a reason the Barossa Farmers Market is so popular – you simply won’t find this blend of both quality and variety in supermarkets. Physical items are also diverse and generally reasonably priced, and as a result the Barossa Farmer’s Markets make for an excellent spot to grab a souvenir of your time in the region. Most stalls are willing to ship your purchase interstate for those travelling from afar, too. The markets make for an excellent spot for a fresh and reasonably-priced breakfast for those visiting the Barossa, and getting there early comes highly recommended as, due to their popularity, the markets are almost eternally busy. Arriving as early as possible allows both avoiding the crowds and for getting the first choice of goods on offer, and while there’s plenty of parking available getting a spot can still be tight – so be prepared to walk a little bit. Open each Saturday morning from 7am to 11:30am, the Barossa Farmers Market are a must-visit for foodies in the region, and are also undercover so that rain need not deter you from visiting. Whether it’s for breakfast or an early lunch, there are few better value and down-to-earth spots to go in the Barossa that come with a dose of hospitality to boot. Who’d have thought a simple concrete reservoir could become a popular tourist attraction?The Whispering Wall of Williamstown in the Barossa Valley is a weird and wonderful example of an (unintentionally-created) natural phenomena at work. While it’s nothing particularly special to look at – visually, it’s merely a century-plus old dam created to hold back the waters of the Barossa Reservoir – the Whispering Wall’s curved shape leads to voices being carried from one side of its arch to the other. This means that even a whisper can be heard clearly over 100 metres away, and is from which it derives its name. Created via a parabolic effect due to the reservoir’s construction, it’s a marvellous natural phenomenon that’s simple in its enjoyment; even music played from a small pocket player can be heard almost crystal-clear on the other side. The reservoir is curated with information detailing the scientific aspects of its aural function as well as its construction, providing a nice little dose of “why” behind the “what”. Local legend says that the effect of the dam’s shape was originally discovered as a result of workers badmouthing their boss in low voices on one side of the reservoir – and then being fired once they reached the other. Regardless of your belief in such a tale, the effect remains for public enjoyment to this day, and its increased popularity has lead to a number of tourist-friendly amenities having been constructed by local authorities to make an extended visit here more enjoyable. It’s a quite scenic location in and of itself, too, offering a great vantage point from which to take in some of the surrounding water and bush environment, too, and makes for a pleasant backdrop for lunch. The children will be entertained by the voice-throwing effect, while you can relax and enjoy the views or read the interesting curation on the reservoir’s history. The Whispering Wall resides in Williamstown in the Barossa Valley and its located amongst a nice, natural and green area replete with clean facilities – including toilets, picnic area, shade and plenty of parking – for a BBQ or picnic. Given its uniqueness, the reservoir makes for a great little side trip if touring the Barossa’s wineries; simply bring some food, enjoy a picnic, and marvel at the phenomena of throwing your voice hundreds of metres away! Located just a short distance from the previous entry on this list, those looking to dabble in the solid end of the Barossa’s culinary spectrum can pay a visit to this excellent hybrid store/restaurant that specialises in variety. Maggie Beer (yes, that’s her actual last name) has long been an acclaimed figure on the Australian foodie scene, and her signature Farm Shop has been delighting visitors from afar since the late 1970’s – first, as a standalone store, and later with the addition of a standout restaurant that still runs in full force to this day. People come from afar to try the mixture of jams, oils, dressings, pates, ice creams and gift hampers that contain an assortment of gourmet food, wine and produce. It’s this variety in flavours that makes a visit here special; the Shop serves as a great overall celebration of the diversity of produce in the Barossa region, and the opportunity to sample a whole host of different tastes and textures makes a visit here an enjoyable exercise in discovery. Maggie Beer’s Farm Shop sits in a lovely, lakeside location with outdoor seating offered on a deck right next to the water that makes for a great spot for dining outdoors on a lazy Barossa afternoon. If you’re lucky you may even spot a couple of turtles plying their trade in the waters. This scenic aspect adds to the food to make for as much of an “experience” as it is a mere cafe/restaurant, as there’s plenty to do that makes the trip worthwhile. Of course, the food remains the primary focus of a visit to Maggie’s, and in this regard it does not disappoint; while much of the menu is oriented around simplicity, the dishes are hearty and filling without being too heavy, with the likes of soups, breads, and pates featuring prominently. For those merely looking to snack, the venue offers “picnic baskets” which provide a mix of bread, pate and other toppings that are ideal for enjoying in the verdant surrounds. The store itself is extensive in its array of Maggie-backed products; food enthusiasts can spend ages simply wandering around the store and ogling the various creative concoctions contained within the various jars and other containers. There’s likely to be a new twist on a conventional flavour or condiment you’ve never encountered before, and grabbing a jar or two can go a long way to livening up your standard home-cooked meals. For those wanting some further tips and insight, Maggie Beer’s Farm Shop also offers public cooking demonstrations held in the kitchen at 2:00pm (the same kitchen from which Maggie’s show was shot). Staff are also friendly and upbeat, contributing to the overall lively atmosphere of the place that helps it feel welcoming to both tourists and locals alike.They continually make a concerted effort to replenish the tasting samples, too, to ensure no customer misses out. After you’ve tasted (or bought) your fill, it’s a final pleasure to take a stroll around the water and the farm itself, getting up close with the peacocks, quails, pheasants and other bird life. If you’re looking for a unique, food-oriented keepsake from your time in the Barossa, then a stop at Maggie’s is a must. While there are numerous conventional ways to explore the Barossa’s wineries and landscape – both on the ground and in the air – those looking for an experience that’s truly something unique can opt for a Segway tour at one of the region’s most acclaimed wineries. Local operator Segway Sensation SA offer visitors the chance to hop aboard and pilot their own futuristic vehicle; a vertically-aligned, two-wheeled electric Segway that provides a remarkably smooth ride amongst the vines. While the sight of the vehicles might initially make them seem daunting, their combination of ease of usability and self-balancing functionality make Segways a joy to navigate with. All you need to do is control the level of acceleration via the angle of your feet and distribution of your weight (no brakes needed), and you’ll soon find yourself zipping around the mixture of old architecture, bridges, and the vines themselves that make Seppeltsfield such a scenic place. These guided tours begin with a short lesson from your friendly Segway guides, who ensure that everyone feels confident and comfortable piloting their device, including the chance to test your skill at turning and going up hill, before the journey begins. Those looking for an experience that’s truly something unique can opt for a Segway tour at one of the region’s most acclaimed wineries. The tour takes participants on a journey to some of the best areas within the grounds of the historic winery that aren’t normally accessible on a traditional tour, and are conducted in a manner that’s safety-conscious but still done with a sense of humour. Throughout the tour, you can expect a mixture of learning about the history of Seppeltsfield as a vineyard and a brand, while soaking in the scenery of the winery itself, which is quite panoramic. Some of the vines on display clock in at 100 years old, while their surrounding grounds are also kept in immaculately-groomed condition. There’s also plenty of opportunities for posing for photo ops throughout the roughly-hour duration, with three tours per day available for booking. Seppeltsfield itself is well worth spending some time at once your Segway trip is complete, as the winery is not only pretty to look at, but offers excellent lunches and wine tastings – as well as the ability to purchase and take home some of the label’s finest for yourself. The first of its kind of tour in South Australia, a Segway tour may not be the first option to spring to mind as a method of exploring the Barossa, however it’s almost certain to rank among the most unique and memorable. Those looking to combine taking in the Barossa’s scenery with a dose of added exercise all conducted at your own pace can take the opportunity to don a helmet and hop on two wheels for a custom adventure. The close proximity of a number of the region’s best wineries to one another – coupled with the inherently scenic landscape – makes the Barossa one of Australia’s most enjoyable leisurely rides, and the region boasts an extensive array of well-constructed, sealed track ideal for both walking and riding. Featuring a number of individual cycling trails that link together the Barossa Valley’s major towns, adding a bike to the proceedings allows visitors to cover a lot more ground than merely walking, while still taking in some of the key highlights of the region’s landscape. Largely based around the remnants of the historic Gawler to Angaston train line, the newest sections of the region’s cycle trails have only recently been completed in the last few years, and as a result are largely still in excellent condition. Its signature section is the newly-completed Jack Bobridge Track, which extends between Gawler and Lyndoch, and then onwards to the main township of Tanunda for around 14 kilometres in each section. The trail offers a great mixture of geographical beauty, potential winery stops, and ample chances to see local Aussie wildlife such as kangaroos and even echidnas along the way, including the home of flagship wine brand Jacob’s Creek. Offering views across the vineyards and fields dotted with gums and other trees, it’s a characteristic example of a South Australian landscape at its best. The Barossa’s never-too-warm weather leads to a cycle-friendly climate throughout all but the coldest parts of the year, too, with only the occasional summer flare up making things uncomfortable for riders. The close proximity of a number of the region’s best wineries to one another – coupled with the inherently scenic landscape – makes the Barossa one of Australia’s most enjoyable leisurely rides. Those looking to put their legs to work and hire a bike can do so courtesy of local operator Barossa Bike Hire, who offer a fleet over different bicycle types ranging from standard to tandem, mountain, and even electric bikes (for the lazy among us). Bikes can be both hired directly from their operation in the town of Nuriootpa, while an accommodation delivery service is also offered for an added dose of convenience. Service is friendly and patient, allowing aspiring riders to try a number of different bikes for the best fit, and then you’re off to sample the visual and taste delights of the Barossa at your leisure, before returning or dropping off the bikes at the end of the day. Lastly, while it’s tempting to want to indulge in a helping of wineries along your cycling route, bear in mind that sensible consumption of alcohol is still advised as the same laws apply as to drink-driving in South Australia. While accommodation is often merely a means to an end for those travelling, the Barossa Valley’s incredibly unique Kingsford Homestead is distinctive enough so as to rank as an attraction in its own right. Perhaps most famously known in recent years as the set for popular Aussie TV series “McLeod’s Daughters”, all it takes is the initial drive up the homestead’s long, sweeping driveway to known you’ll soon be in for a treat with a visit here. The building of the homestead itself is the obvious eye-catcher; featuring just a handful of luxurious suites within its mid-1800’s-constructed Georgian sandstone frame, it’s a remarkable throwback piece of architecture in its own right and sets the scene for things to come. Having been continually maintained and improved by its current owners, the Homestead offers guests an interesting mixture of Australian history with a number of welcome modern additions to help make stays more comfortable. Each suite has had a luxurious ensuite added, while the amenities are also updated without having the building lose its inherent rustic charm. It’s this blend of old-meets-new that has lead to Kingsford Homestead becoming an exceedingly popular spot for a range of events (such as weddings), or simply as an indulgent getaway that’s basically situated in the middle of nowhere – which is part of its appeal. Service is likewise hard to fault, with seemingly no request ever too overbearing to be carried out, yet conducted with a friendly and warm attitude that never seems snooty. There are plenty of supplementary experiences to be had in both the building and its surrounding grounds, too. aside from the obvious closeness to the many excellent wineries of the Barossa, the homestead itself has its own wine cellar in which tastings can be enjoyed. Spa treatments are available for those looking for some pampering; and there is simple joy to be had in taking a stroll through the scenic, rolling nature that encompasses it all. Its signature riverside outdoor bath offers another highlight for the adventurous, too. Lastly, the pure visual appeal of the surroundings – the homestead still doubles as a sheep station – means kicking back and enjoying a drink while soaking in the scenery and perhaps spotting a kangaroo or three is enjoyment in itself. One of the Barossa’s more unique attractions that blends together both the man-made and the natural into an interesting combination, this makes for an ideal starting point for first-time visitors to the region looking to gain the lay of the land. For one of the best available overviews of the Barossa Valley’s scenery, head for the Barossa Valley Sculpture Park at Mengler’s Hill which offers a sweeping, 180 degree panorama of the various wineries and fields that make up the region’s verdant landscape. Making for a wonderful spot for a photograph, or an idyllic break between trips to wineries, the site is host to a number of distinctive pieces of abstract art that have been sculpted by a number of renowned artists at a duo of symposiums – the first of which was held back in 1988, and the following on the 20th anniversary in 2008. Carved in a mixture of black and brown granite, the sculptures were created to serve as an artistic interpretation of the nature of this part of South Australia, and make for an intriguing complement to the panoramic views on offer from the lookout. It also doubles as a lovely spot for a picnic, with facilities to utilise for those bringing their own lunch, while also accessible via carpark ramp for those needing both stroller and wheelchair access. Easily reached via a short drive from all major locations in the northern portion of the Barossa, the Barossa Sculpture Park is a simple yet enjoyable pleasure – with the bonus of being entirely free.